To improve the crashworthiness of the F-150 SuperCrew, Ford used steel bars welded to the pickup's frame that help prevent the front wheels from intruding into the passenger area in a crash involving the front corner. The parts aren't included on the F-150's other cab configurations. Last Thursday morning in rural northern Virginia, a silver 2015 Ford F-150 SuperCab 4x2 slammed violently into a concrete abutment at 40 mph. It was a loud and unusual crash. But it was no accident. Rather, it was an unprecedented follow-up crash test of a lower-volume pickup model by the Insurance Institute for Highway Safety. According to IIHS, the test was done specifically because Automotive News alerted it to extra safety equipment that Ford installed on the top-selling SuperCrew model -- the single model that IIHS normally tests -- but not on its Regular Cab or SuperCab F-150s. Other pickup makers will be subject to new tests on their lower-volume models starting next year, an IIHS spokesman said. The new tests show the determination of the privately funded IIHS to root out any hint of gamesmanship on the part of automakers seeking to do just enough to ace the group's difficult crash tests and earn its top ratings. Indeed, IIHS has launched what it calls a "research project" to determine the extent to which automakers might be taking shortcuts to pass the small-overlap test. IIHS had planned to release a special single-vehicle safety report for the 2015 F-150 because of the pickup's popularity and its transition to an aluminum body. But that report -- based on crash-test results from just the top-selling SuperCrew version, as was the institute's established practice -- has been delayed until at least July, an IIHS spokesman said. The reason: to allow extra time to crash-test other F-150 configurations and "give consumers comprehensive information about the F-150's performance," the spokes-man, Russ Rader, told Automotive News. A Ford safety spokeswoman confirmed that Ford adds "supplementary material" to its SuperCrew model to "reinforce cab strength." The 2015 F-150 has 3 basic cab configurations. 1. SuperCrew: 4 doors, hinged at the front, and full-size rear seating. This “crew cab” configuration makes up the majority of the industry's pickup sales. 2. SuperCab: 2 front-hinged doors in front and 2 smaller, rear-hinged doors in back, with less rear interior space than a crew cab. This is sometimes called an “extended cab” by other automakers. 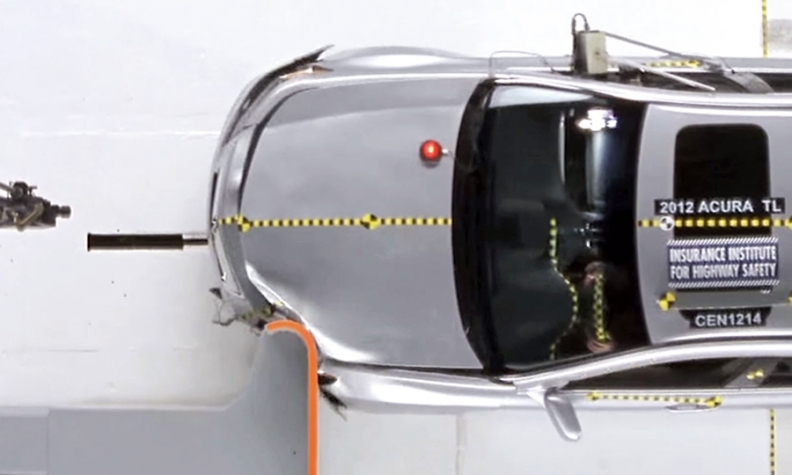 In the IIHS small-overlap frontal crash test, begun in 2012, a vehicle travels at 40 mph toward a 5-foot-tall rigid barrier, with 25% of the total width of the vehicle striking the barrier on the driver's side. To determine the ratings, the institute's engineers look at 3 factors. Thursday's extraordinary test was on a SuperCab model that has a smaller rear passenger compartment and accounts for 25 percent of the F-150's sales, compared with 70 percent for the SuperCrew, Ford says. Regular Cab F-150s account for the remaining 5 percent. This spring, the National Highway Traffic Safety Administration subjected all three cab versions of the F-150 to its own battery of crash tests. All three earned five stars, the federal agency's highest rating, and the achievement features prominently in Ford's F-150 marketing. IIHS also conducts a different set of tests, including, as of 2012, a small-overlap frontal crash test that has confounded many automakers. To safeguard passengers in its most important vehicle, Ford installed roughly foot-long assemblies of tubular steel, welded to the SuperCrew model's frame, in front of and behind both front wheels. 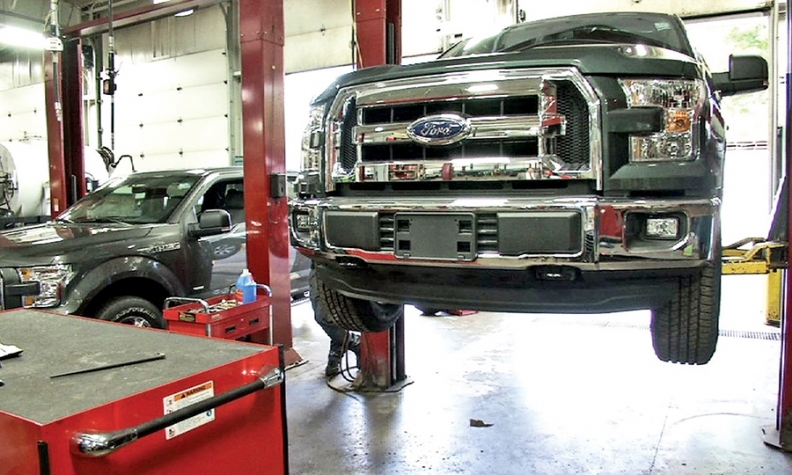 In the repair information it provides to collision shops, Ford calls the parts "Frame Bracket with Crew Cab Protectors." They are priced from about $50 to $58. According to independent automotive engineers, collision experts and top IIHS testing officials, Ford's protectors on the SuperCrew model help prevent the wheels from intruding into the passenger area when the front corner of the truck strikes another vehicle or object at high speed. "There are a lot of different things OEMs are looking at to try and get the best results for this type of collision," said one collision expert. The small-overlap test "is one of the more horrific crash tests I've seen because you don't have a lot of the vehicle to stop that energy before it's into the passenger compartment." So why are the protectors absent from the other 30 percent of F-150s? "We optimize each cab structure based on many factors including cab style, mass, wheelbase, powertrain and driveline to meet regulatory requirements and achieve public domain ratings," the Ford safety spokeswoman said. The different safety configurations among models puzzled some outside experts consulted by Automotive News. Third-party engineers said it was their opinion that the protectors were added to the SuperCrew model for the sake of passing the IIHS test. That's no surprise, says Joe Nolan, senior vice president for vehicle research at IIHS and head of its crash lab. He said IIHS alerted automakers five years ago that it would begin conducting the small-overlap tests in 2012, and automakers have responded by striving to improve their test performance. "We definitely can see -- certainly for the small-overlap test -- countermeasures that automakers have put in," Nolan said. He said he was glad to see that Ford had installed the protectors for both front wheels on the SuperCrew F-150s because it indicated a genuine attempt to improve safety. "If you were just trying to beat the test, [the protectors] could only be on the driver's side," Nolan explained, because that's the side where the small-overlap test is done. Still, having safety equipment vary across the myriad configurations of the same model could be problematic for IIHS and the reliability of its safety ratings in the long run, Nolan said. Ryan Beene and Nick Bunkley contributed to this report.